Ah the summer holidays. The chance to relax, enjoy the sunshine (sometimes!) and catch up with friends you haven’t seen for a long time. We got back this week from a week in Crete (which was lovely), which is why it has been a little quiet on the blog front. 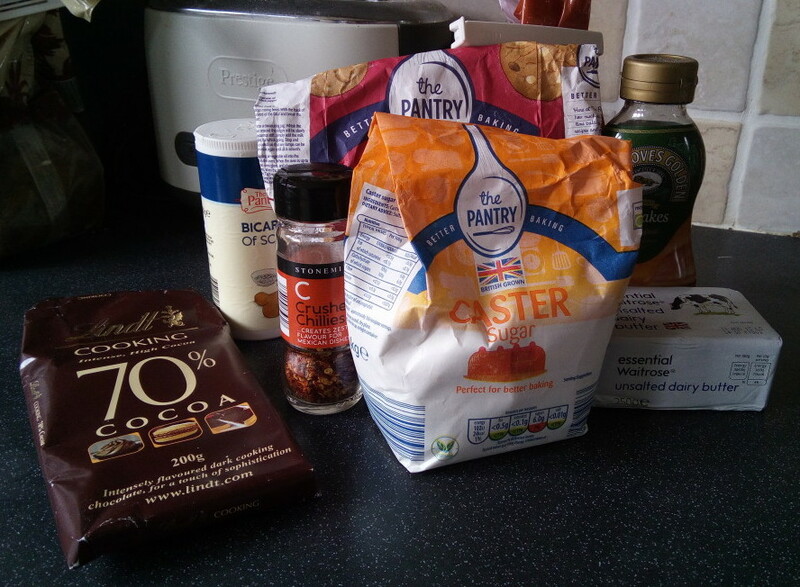 But never fear, I have more than made up for it this week with three bakes over the last few days! I caught up with one of my friends Kathryn on Thursday. She doesn’t eat egg so I always keep my eyes open for egg free bakes which I can make. I’ve made double chocolate shortbread and Mary Berry’s cranberry and white chocolate shortbread for our catch ups before. 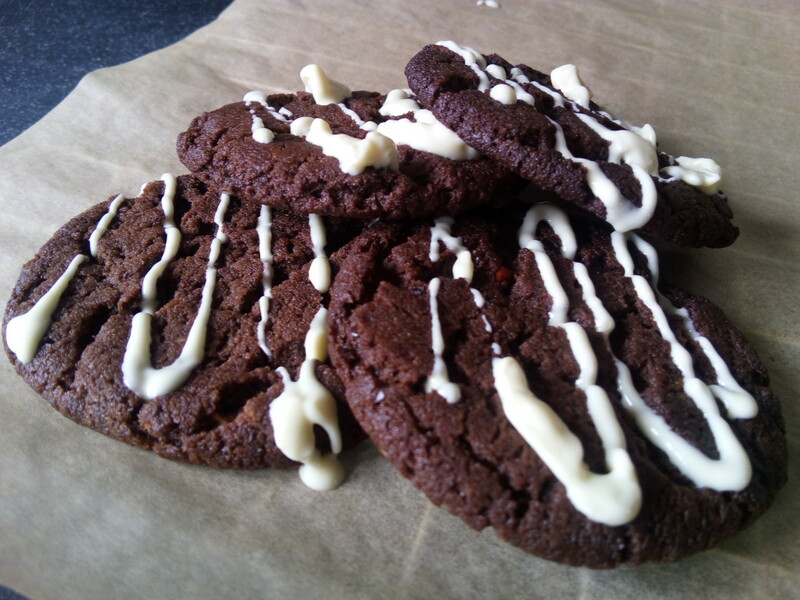 This time I decided to opt for Jo Wheatley’s chilli chocolate cookies. They certainly have quite a kick to them! The description says they should be crisp on the outside and chewy in the middle. 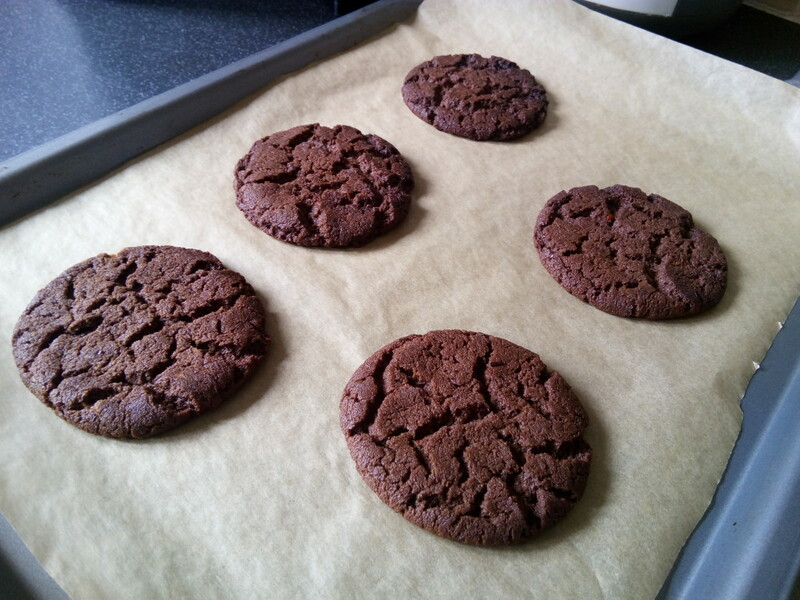 Mine were definitely more cripsy than chewy, I think I might have left them in the oven a little bit too long as they were starting to go a little but dark around the edges (I’d have had some disapproving looks from Paul Hollywood if I’d been on the Great British Bake Off!) 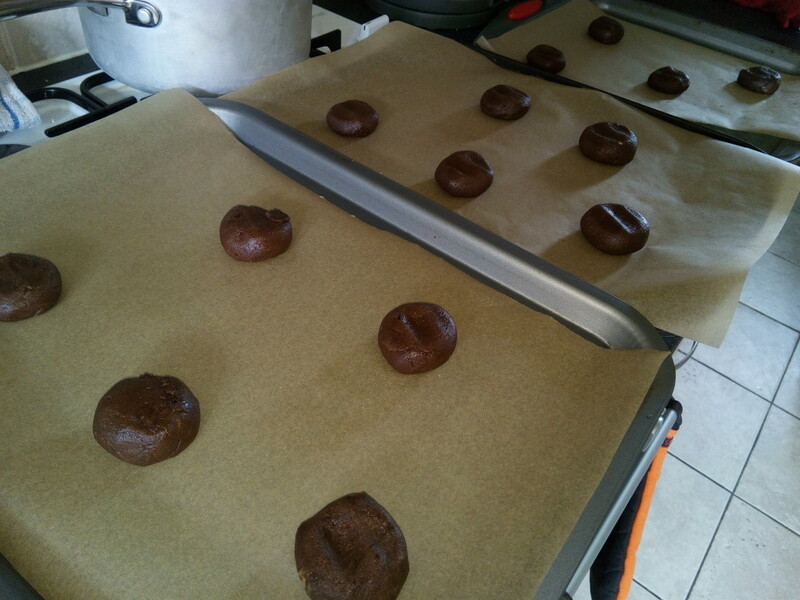 The recipe will make 12-15 cookies (I made 14) and you’ll need 3 baking trays and a microwaveable food bag or piping bag for the chocolate decoration. 1) Line 3 large baking trays with baking parchment. 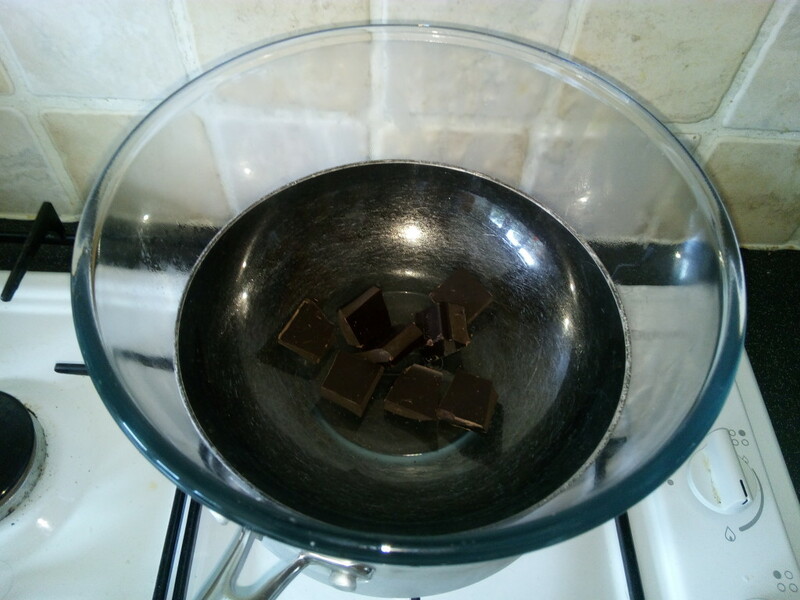 2) Melt the dark chocolate in a heatproof bowl over a pan or barley simmering water (alternatively you can melt it in a microwave on a low-setting in 2-second bursts). Leave to one side to cool slightly. 3) Grind the chilli flakes and a pinch of the caster sugar together with a pestle and mortar until you have a find powder (alternatively you can use a mug or small owl and the end of a rolling pin). 3) Put all of the remaining ingredients in the bowl of a food processor and blend until combines. Add the melted chocolate and chilli sugar and pulse until the mixture comes together (you might need to scrape down the sides to help it on its way). 4) Roll into 12-15 small balls and flatten slightly on to the three baking sheets (4 – 5 on each one as they will spread as they cook). 5) Freeze or chill for half an hour until firm while you preheat the oven to 170C/325F/Gas 3. 6) Bake on the middle shelf of your oven for 15-18 minutes before transferring to a wire rack to cool completely (they will still look and feel quite soft but they harden up as they cool. 7) To decorate melt the white chocolate in a microwaveable sandwich bag in the microwave on a low setting in 10-second bursts. Alternatively if like me you don’t have a microwaveable bag put the chocolate in a piping bag and place the piping bag in a heatproof bowl over a pan or barley simmering water. 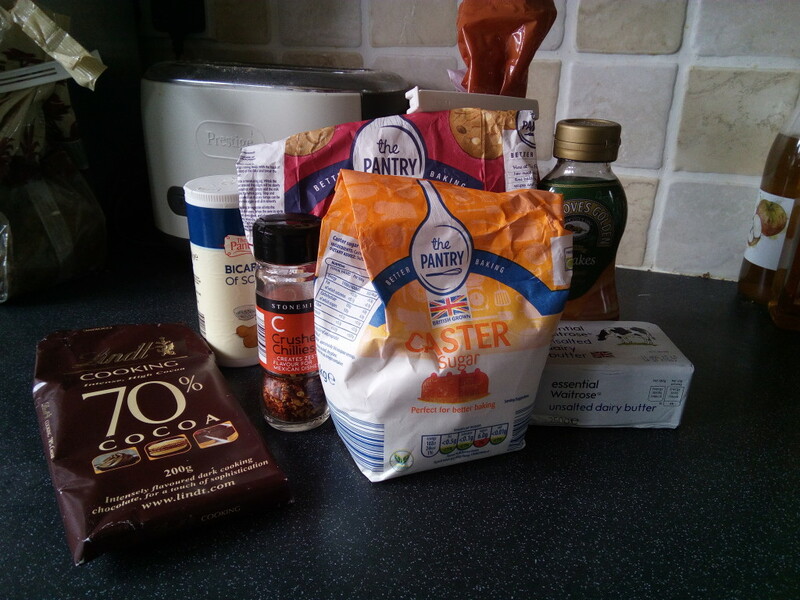 Once your chocolate has melted, snip the end off the bag and drizzle the white chocolate over the cooled biscuits.